Originally established in 1779 as the seat of Washington County, North Carolina, Jonesborough is the oldest incorporated town in Tennessee. Early pioneers were given land grants to settle west of the mountains, but by 1784, they no longer trusted their political leaders in North Carolina. They created their own local government and established the state of Franklin, naming Jonesborough the original capital of the �lost� 14th state. Never recognized by Congress, Franklin eventually fizzled out and Tennessee was formed. Although Tennessee was a slave-holding state prior to the Civil War, Jonesborough produced the earliest regularly published periodical devoted to abolishing slavery. 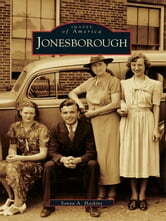 Today, Jonesborough is listed on the National Register of Historic Places, with many buildings fully restored. In this volume, readers will see the Christopher Taylor House, which was built about 1778, and the Chester Inn, which hosted many famous guests in its original days, including Presidents Andrew Jackson, Andrew Johnson, and James K. Polk.